Just realised I uploaded only the XXL.exe! Maybe someone can reupload files? The only one link that works is bymski link, but he only uploaded .exe file, without .txt one. It's quite amazing to finally play a little bit more "LARGER" maps! Thanks a lot for this amazing patch mate! There you can find a new 8MM6 template with full underground as well. But be sure to backup your heroes3.exe as it may differ from that the patch is intended for. Does it work with HeroesHD? Yes, it works with HD mod and WoG. Read the thread. Cool, I finally got it too work with HOMMIII Complete! and unzipped them all to the game folder. I then applied the HD Mod patch, ran the SOD version exe, created a random map, and exited the game. Then I ran the Complete version exe and played the map. 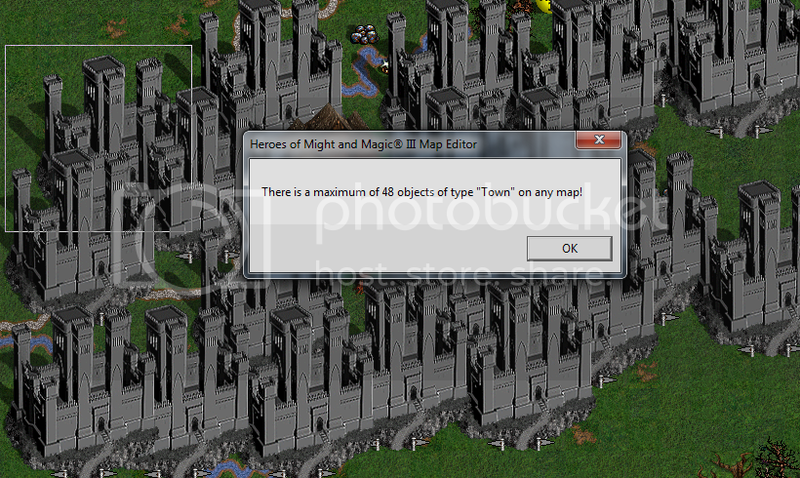 The XXL map editor doesn't generate random maps, only editing existing ones. Created a random map and played it. But for some reason it kept crashing on the second turn. The map shouldn't have any problems because I verified it with the map editor. Other maps I could play a bit longer. Is there a fix for this? If you want to play already-created-with-the-map-editor random maps, just use HD mod only (no need to use XXL patch here). I'm using the Heroes Complete exe version 4.0 with only the HD patched applied (no WoG). I also tested the random map with a SOD exe prepatched with XXL and it also crashed at the end of the first or second turn. I think I've figured out what's wrong with the map: there are too many towns. I deleted the number of towns on that map until I got 48 remaining, which is the game's imposed limit, and then tested the map. There weren't any crashes after the first eight turns. I'm going to play it longer to see how well it goes. Edited by Salamandre at 17:34, 08 Jul 2011. AlexSp, have you any intentions/possibilities to change the limit of towns and other stuff for XXL maps? I need to know that before starting working on one, so I could adapt the design from scattered to stuffed. Map did well for me. Created 252 Clash of Dragons random, wogified it and played for 14 months and it worked fine apart from normal resolution. The only issue was the content of treasure zones, which is 128 Utopias (counted), 50+ dwellings for each of Azure/Crystal dragons (before wogification, that is) and uncountable lots of relics, which become useless after a while. Replacing them with Emerald Towers and other goodies would be interesting. But I guess possibilities of editing RMG are limited? Warmonger, you mean map did not crash if the allowed number of dwellings was increased? Edited by Warmonger at 17:37, 08 Jul 2011. Hey, how you were able to create random map with more than 48 castles? Does RMG ever allow it? No, game seems to allow them - however, there may be a cap of 256, needs testing. Yes, you can add >48 towns, just tested. Open any random XXL map from the package and start adding. Once the towns are grayed in the editor, you still can add them, but I wonder if map will not crash when playing. Edited by Salamandre at 18:14, 08 Jul 2011. Uhm, which exact package do you mean? Few last links are corrupted or don't contain any new files for me.